Ohio Resource Center for Mathematics, Science and Language Arts Educators - This is a collection of technology integrated lessons, online applications, videos, articles, and structured activities that can be used by teacher educators and professional development providers to help teachers learn to effectively integrate electronic technologies into classroom instruction. Cinquain lesson - Use this technology integration lesson in a variety of subjects. Curriculum-Based Technology Integration Activities - Baltimore County Public Schools database of lessons. Cyber Bee has a page of Curriculum Ideas - This site lists many interesting ways how the Internet can be used in the classroom. ETrip - (PreK - 12) Step by step directions for students, all subject areas, all grades - from the Instructional Technology Department, Midway ISD, Waco, TX. Fast Food Fun - Use the Internet and spreadsheets to find calories and fat in a typical fast food meal. Then visit the United States Department of Agriculture to find out more about healthy eating guidelines. Graphing Stratospheric Ozone - A project posted at the Exploratorium, designed for high school students. Lesson Plans from East Detroit Public Schools - Lesson plans which integrate technology (Elementary, Middle, and High School). Microsoft Education Many lesson plans, organized by grade and subject, that build Microsoft Office skills while learning subject matter. Very easy to navigate. Teaching with the Web - From Kennesaw State University, organized by grade level K through 12 - many ideas to get you started! Teaching with the Web - A compilation of ideas for using WWW resources as a language teaching tool. 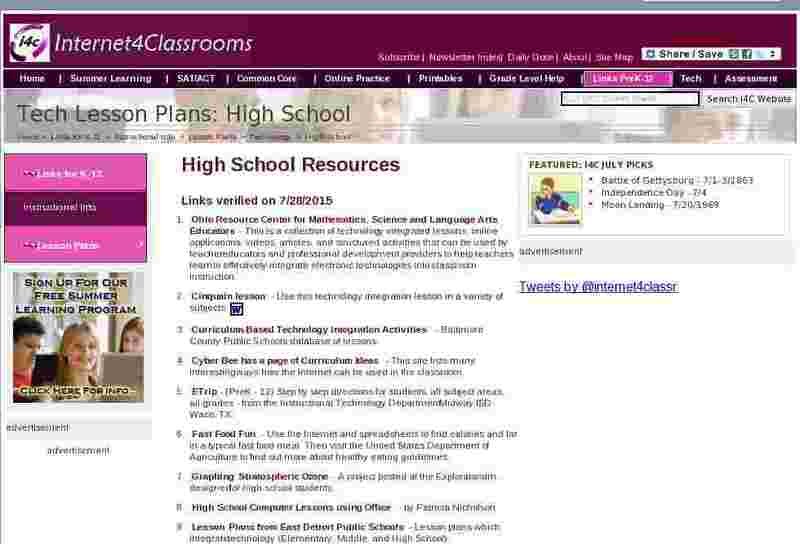 WebGuide template from Internet 4 Classrooms.